The structure of FCCAN consists of the Spokescouncil (roughly the equivalent of a board of directors), the staff coordinator, affiliates and dedicated volunteers. The Spokescouncil is responsible for overall oversight, policy-making and fundraising. The coordinator manages interns and volunteers, administers day-to-day activities, leads grant writing initiatives and other fundraising and coordinates the work of the affiliates. FCCAN as a whole has about 50 active volunteers who are generally local community members, activists and students. 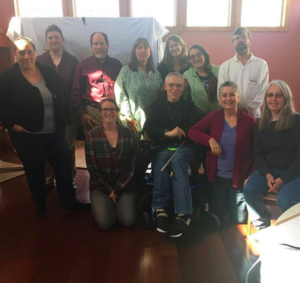 Some of our spokescouncil members, volunteers and staff together during the 2018 retreat. Shirley graduated with a Master’s degree in Ethnic Studies from Colorado State University and a graduate certificate in Gender, Power and Sexuality from the Center for Women’s Studies and Gender Research. Prior to her arrival to Fort Collins she worked as a restorative justice facilitator on the Northside of Chicago. Shirley also teaches Tai Chi and Yoga, where she pulls from her Chinese Buddhist spiritual background to teach classes specifically designed to heal and nurture the body, mind and spirit. Shirley’s activism utilizes both her professional experience of community organizing along with her intellectual grounding in ethnic studies and women’s studies. Jovan is a fifth-year undergraduate student studying Women’s and Gender Studies, and Ethnic Studies. Having been born in Longmont, Colorado and growing up in Fort Collins, Jovan has been surrounded by the beauty, character, and history of northern Colorado his entire life. With a passion for social, political, and economic justice, Jovan hopes to bring intersectional Feminist praxis to a long-term career in education. It is his belief that we can begin to decolonize educational practices and our greater society through critical and reflexive thought and action. It is his firm belief that coffee, carbs, and cheese are the three keys to living a happy life. Zora is a CSU graduate with a degree in Ethnic Studies and a minor in creative writing. She will be interning with us and working with/around the Homeless Coalition, food justice, and worker’s rights this semester. She has a passion for social justice and believes that we must strive towards liberation. She also believes writing is one of the main recourses for healing. She is a poet whose work mainly focuses on themes of race, friendship, and love. While serving as our intern she is also working as the office coordinator for Womens’ Studies on campus. When she is not working or writing she is hanging out with her grey tabby cat Bilbo. BT Huntley has been a peace and justice activist since the early 1980s, when she began leading fact-finding missions to Central America to help U.S. citizens become aware of the refugee crisis caused partly by U.S. military support of repressive governments. She is a Latin American historian who has taught Latin American, Mexican, Colorado, and Women’s history, as well as Women’s Studies courses at Front Range Community College since 1993. She just retired from her full-time position, where she served as department chair for 14 years, and is continuing to teach as Professor Emeritus. She grows most of her own food on a small farm and is passionate about gardening and travel. BT served on the steering committee of Strength Through Peace for about 15 years and has been on the FCCAN Spokescouncil for almost as long. Sally Dowiatt is recently returned to activism after a 25 year career as a special education teacher. Before that, she was active in the Catholic Worker movement in Denver and helped organize the mass rallies and direct action events to close the Rocky Flats Nuclear Weapons plant west of Denver. She also was one of the cofounders of the Rocky Mountain Justice and Peace Center in Boulder. Sally’s varied activist career included the editor of the CoPirg state magazine, Colorado Outlook, and advocate for the first Boulder Safehouse for abused women and a brief stint as a radio talk show host for KGNU radio. Kevin got his start as an activist opposing U.S. support for the Contras in Nicaragua in the 1980s. He has been involved with FCCAN affiliates since 2002, and has been a member of the FCCAN Spokescouncil since 2008. Kevin helped found the Fort Collins Sustainability Group (FCSG) in 2005, and has convened it since then. He served on the Strength Through Peace Steering Committee from 2002 until 2018, and convened it for much of that time. Kevin has a B.S. degree in Physics from the University of California – Davis and an M.S. degree in Mechanical Engineering from the University of Wisconsin – Madison. He currently works as a Senior Project Developer for a large energy services company, and is registered as a Professional Engineer in the State of Colorado. Kevin has also taught high school and college classes in math and science in California and Wisconsin. Lynn Thompson has a long-standing interest in fighting for the civil, constitutional, and human rights of poor and marginalized communities. 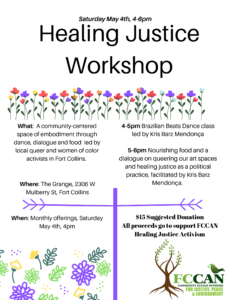 She joined the Fort Collins Homeless Coalition (FCHC) in 2014, just a few months after she moved to Fort Collins, and serves as their representative on the FCCAN Spokescouncil. As a member of FCHC, she has worked to defeat numerous sit/lie bans, fought against the City’s camping ban, supported the statewide Colorado Right to Rest Act, pushed for city-wide improvements such as Sunday bus service, 24/7 public bathrooms, year-round drinking water, & 24/7 storage lockers, and engaged in community education efforts. Lynn is also a member of the Northern Colorado Potters Guild, where she explores her fascination with clay and ceramics. Marcia Fitzhorn has lived in Fort Collins since 1980 and is a Medical Social Worker at a local hospital. She currently acts as liaison to Barrier Busters: Public Transit Action Group which initially met in 2005. She first became interested in social justice issues in 1997 concerning issues with police placed in schools (2 years before the Columbine tragedy). This led to a degree in Social Work at CSU in 2000 at the age of 47, followed by 3 years at Larimer County Child Protection, and resulting in a Master’s in Social Work in 2004. Over the years, Marcia was involved as a volunteer in many community areas: the Poudre School District (21 years), a CASA advocate, and as a proponent of Restorative Justice. Then in 2001, she discovered CJPE and began working on the board beside other activists who eventually brought the group to non-profit status. FCCAN meets a need for Marcia to remain relevant and involved in her community. Steve Ramer is currently the Pastor of the Fort Collins Mennonite Fellowship. Born and raised on a wheat farm in Kansas, he enjoys the great Colorado outdoors; hiking, biking and skiing. He is married to Dr. Cathy Egan and is the father of two wonderful adult daughters, Gabriela and Lea. Previous vocational experiences include being a college instructor, a mission worker, volunteer coordinator and working with the mentally ill. He taught in the Philippines for two years, lived and worked in Harrisburg, PA in a large group home for the mentally ill for five years, and then live in an inner-city neighborhood in Washington DC for 17 years prior to moving to Ft Collins, CO. He has been a Christian Peacemaker Team (CPT) reservist since 2004 involved in projects in Washington, DC, the Philippines and Israel-Palestine. Gerri has been a member of the spokescouncil for the past three years after a long time member of the school board and volunteer with FCCAN. Gerri is an advocate for medicare for all and universal healthcare and is passionate about food access, food justice and an active member of the Fort Collins Democratic Socialists of America. Cheryl Distaso is a long-time social justice activist. She worked as the coordinator of FCCAN for over 15 years. She has worked on numerous local campaigns and organizing efforts in that capacity, including the successful 2011 effort to keep thriving low-income schools open, organizing with neighbors of two local mobile home communities to secure relocation funds when their homes got demolished for redevelopment in 2008 and 2011, fighting the horrific sit-lie ban in 2016. She is thrilled to transition into a spokescouncil role for FCCAN and stay involved in a different capacity. She is currently teaching community organizing courses to social work graduate students at CSU as well as on-line with Village Earth, a local NGO. She loves to spend time in the full moon, hiking on moonlit nights in the summer and snowshoeing in the winter. Arpi Miller works on the Fuerza Latina emergency immigration hotline and is a volunteer coordinator with the Education and Outreach team. She also sits on the steering committee of ISAAC – the Interfaith Sanctuary and Accompaniment Coalition – and is part of Plymouth Congregational’s immigration team. She considers herself a Buddeo-Christian and believes insight meditation and the prophetic Christian tradition are critical tools and grounding forces in her own social justice work. Prior to living in Colorado, Arpi spent nearly three years working with a cooperative in highland Guatemala. She returned to California to pursue her PhD in sociology at UCLA with an emphasis in international migration. For a decade, during her masters and doctoral work, she worked with veteran Salvadoran immigrant organizers in the Los Angeles area, where she feels she received an education better than any university. During that time, she traveled to El Salvador regularly to monitor elections and participate in delegations. She currently freelances as a research fellow with the Center for Religion and Civic Culture at USC, and plays mom to two boys and a yellow lab.